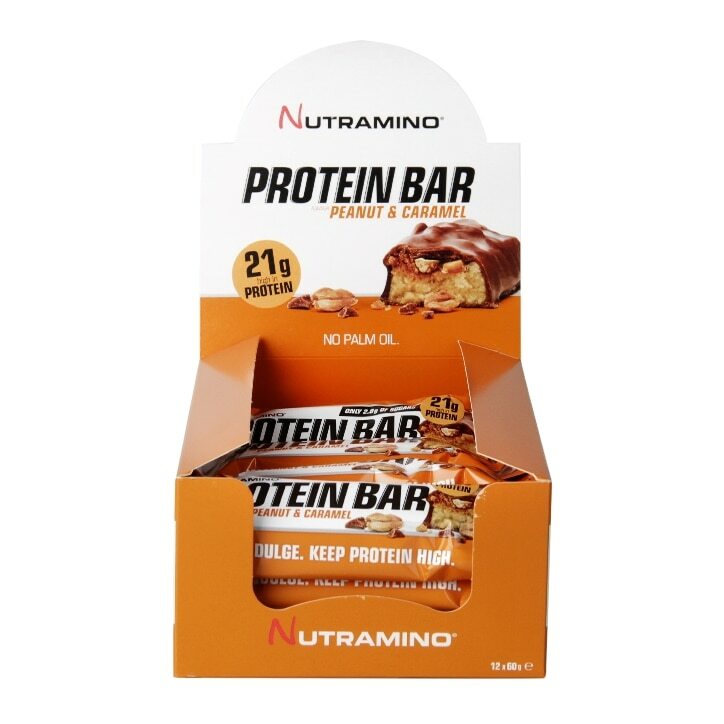 Nutramino Protein bar Peanut & Caramel is for those who want a really tasty protein bar whith a whole 21g of protein - plus a low sugar content. The bar has a protein core with a vanilla taste, coated in crispy chunky peanuts and delicious soft caramel. The taste can rival any classic chocolate bar. Yet naturally you get far more protein, fewer calories and far less sugars - without compromising on taste! Milk chocolate flavoured coating (28 %) (sweetener: maltitol; cocoa butter, whole milk power, cocoa mass, emulsifier: soy lecithins; flavour), milk protein blend (calcium caseinate, whey protein concentrate), collagen peptides, humectant: glycerol; peanuts (12 %), caramel flavour filling (12 %) (sweetener: maltitol syrup; humectant: glycerine; milk protein, cocoa butter, whole milk powder, emulsifiers: lecithins (soy, sunflower)), water, soy protein isolate, soy crisps (1,4 %) (soy protein isolate, low fat cocoa powder, tapioca starch), cocoa butter, non-hydrogenated sunflower oil, flavour, salt, colour: caramel; sweetener: sucralose. May contain traces of gluten, egg and other nuts. May contain traces of gluten, egg and other nuts. Nutramino Protein Bar Chunky Peanut & Caramel is rated 4.8 out of 5 by 13.